Released: Now available for same day shipping! 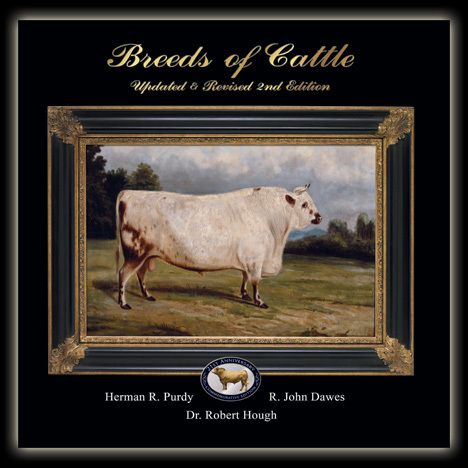 The highly-anticpated second edition of Herman Purdy's classic 1987 Breeds of Cattle is now avilable for same day shipping. Completely revised, updated, and expanded text by John Dawes and Dr. Bob Hough includes twelve additional breeds, bringing the grand total to forty-five with a page count of 400. 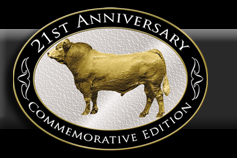 The new edition is fully illustraed with over 400 color and B&W images, including reproductions of rare historic 19th century paintings depicting what the older breeds might have looked like as well as modern ideal full-color formal portraits of a mature bull and cow of each breed to complement the thorough and engagingly written text. The book's breed association authorized documentation includes the history, origin, and the phenotype of each breed as well as current statistics. "This is an art book that's both beautiful and instructive. It's a fun reference that you'll definitely want on yur coffee table." "If you love cattle and cattle breeding, then you will treasure this book." "This is the most complete & informative book of its kind and every university, high school, public and private library should possess this unique book to educate the young and old." "This beautiful book is an absolute classic cattle reference and is a must for any cattleman's library." "This book is a must, I highly recommend it to anyone who has ever had an interest in cattle"
"The updated and revised edition of Breeds of Cattle is not only a fascinating history of the origin and development of some 45 breeds of beef and dairy cattle. It is also an impressive pictorial account, telling the story of cattle through the centuries in striking photographs and historical paintings." "This magnificent book simply cannot be perused casually. Open it anywhere, surrender to the joy of fine historic and contemporary paintings, then settle in for compelling discussions of bovine genetics, history, and geography." The books authorized documentation includes a brief history and origin of the various breeds, along with discussions of phenotype and statistics supplied from the appropriate associations. of the book as featured on RFD-TV's American Rancher!